Proslat's 8 in. double hook (package of 3) is made from heavy duty welded steel. Ideal for power tools, saws, multiple shovels, trimmers and more bulky items. 8" Double hooks are solid and fully locking to secure them in place. Made from steel with rubber cushion to store your goods safely. Made from high grade steel. Weight bearing capacity: 50 lbs. Slightly angled at the tip to store your items in place. Powder coated in Proslat Silver for rugged durability & attractive finish with rubber cushion to store your items without damage. To engage the locking mechanism, push up on the lock plate and tighten into place. The Gladiator Ready to Assemble Garage Wall Cabinet is ideal for storing smaller automotive, gardening, and paint supplies. The cabinet's design makes assembly fast and seamless for you, cutting the time required for setup in half. Pair with Gladiator GearWall panels or GearTrack channels to easily mount and reposition this storage cabinet wherever you need it most. This heavy-duty steel cabinet is as tough as it looks and comes backed by a 10-year limited warranty. Honey-Can-Do SHO-01483 4-tier revolving shoe tree, chrome. Go vertical and store up to 24 pairs of shoes on this brilliant chrome-finish shoe tree. With only a single square foot of space required, you can reclaim floor space while keeping your shoe collection accessible and organized. All four tiers revolve separately to give easy access to every pair. The durable steel construction withstands daily use. Size: 49.25 height x 11.4 width-inch Colour: Chrome finish. With stringent quality control methods, Honey-Can-Do confidently offers a limited lifetime warranty on every product they make. The NewAge Products VersaRac Hanging Bars are the perfect accessory to your VersaRac overhead storage unit. Built durable and safe with extra strong 13 gauge steel, these hanging bars will last a lifetime. They are designed with a powder-coated paint finish that is rust and scratch resistant; available in Hammertone Gray or High-Gloss White to help blend in seamlessly with your ceiling. The heavy duty steel frames can support up to 50 lbs. of weight per bar for hanging your bicycles, sporting equipment or seasonal clothing. They are easy to install onto your adjustable ceiling mounted VersaRac, and provides you the extra storage area you need, while regaining space to park your car. Wall Storage Solutions, 8 Inch Double Hook - 3 Pack Proslat's 8 in. double hook (package of 3) is made from heavy duty welded steel. Ideal for power tools, saws, multiple shovels, trimmers and more bulky items. 8" Double hooks are solid and fully locking to secure them in place. Made from steel with rubber cushion to store your goods safely. 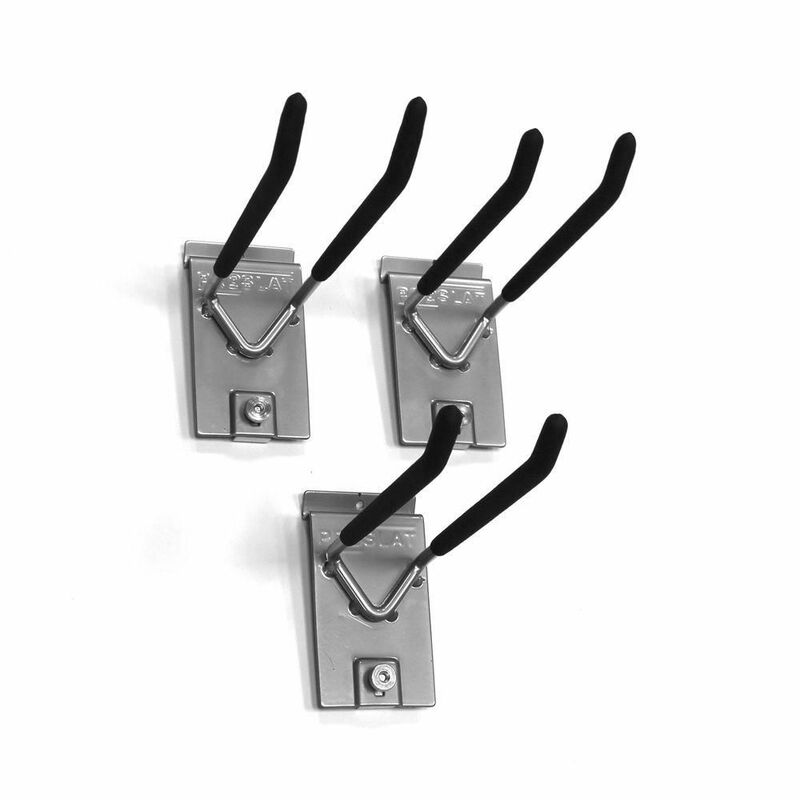 Wall Storage Solutions, 8 Inch Double Hook - 3 Pack is rated 4.7 out of 5 by 3. Can these hooks be used to store skis?